We're sorry, but space Bowling 32 lanes is no longer available. Cancellation policy: 90% refund of fees for cancellation up to 14 days prior to event. If cancelled less than 14 days before the event date, the fees will not be refunded, however rescheduling is possible. CHOOSE 2 MEATS: glazed pork loin, roast turkey or country ham (substitute peppercorn beef tenderloin $5.00) INCLUDES: rolls and gourmet sauces This must be ordered in conjunction with another dining package. MAKE YOUR OWN NACHO STATION COMPLETE WITH ALL THE TRADITIONAL FIXINS. INCLUDES: Nacho Meat, Queso shredded Chedder and Jack Cheese Guacamole, Pico De Gallo Sour Cream, Jalapeños, Black Olives, a Sombrero full of chrispy Tortilla Chips. Must be ordered in conjunction with another dining package. FLAVORS: Chocolate and Vanilla SAUCES: Chocolate, Raspberry and Caramel TOPPINGS: Cherries • Cookie Crumbles Gummy Bears • M&amp;M’S® REESE’S® Cups • Sprinkles • Whipped Cream Must be ordered in conjunction with another dining package. YOUR CHILDHOOD DREAMS COME TRUE: a Delicious Assortment of your favorite Sweets. INCLUDES: Crispy M&amp;M'S® Rice Treats KIT KATS® • Mini SNICKERS® Bars HERSHEY'S KISSES® • Peanut Butter Cups Jelly Beans • SKITTLES® • ROLOS® SWEDISH FISH® • Lollipops Licorice Twists Must be ordered in conjunction with another dining package. Freshly Prepared Hot Dogs, Mini Pretzels and Knishes TOPPINGS: Ketchup • Mustard • Sweet Relish Sweet Onions • Sauerkraut Must be ordered in conjunction with another dining package. Debuting in 2007 and named the South Bay’s “Best Bowling Alley” year after year, Bowlmor Cupertino turns America’s favorite pastime into a high-end, high-energy entertainment experience. 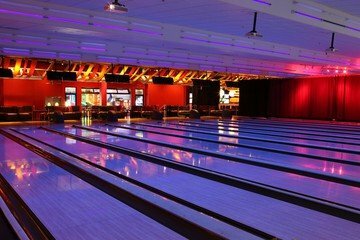 Located in the Vallco Shopping Mall, Bowlmor Cupertino features 32 lanes of electro-cool blacklight bowling, an all-new interactive arcade, a private 8-lane bowling suite that’s outfitted with custom billiard tables. Tucked within Bowlmor Lanes you’ll also find the Silicon Valley Bocce Club, Cupertino’s coolest hangout, where bocce courts, ping pong tables, air hockey, and a private bar bring upscale recreation to a whole new level. Discover the area’s perfect place to party and play, with expert event specialists who will custom-build your next great celebration—whether it’s a child’s birthday, a social gathering among friends, or a legendary office party that will have the whole company buzzing.